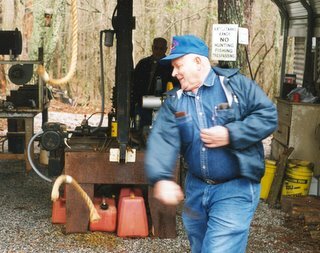 Hand-forged carbon steel, just like the first Bowie. 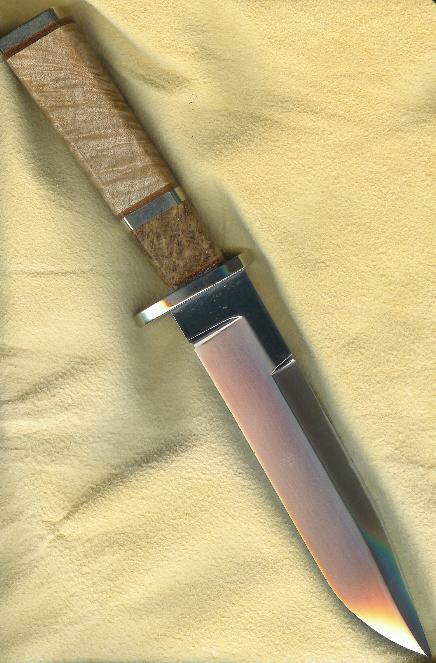 She sports nickel silver fittings and a stabilised tiger-maple/stabilised black ash burl handle with leather washers. She is borne in a leather Randall-styled sheath with a belt/frog stud. Crafted of 0-1 tool steel, Oriental-styled wrap over blk rayskin & your choice of a blk leather or Kydex sheath. The blade is crafted of A-2 tool steel and features a file-worked spine and a long & wide nail nick for opening with gloved hands, if necessary. The liners and pins are brass & the handles are carbon-fiber. It has a half-stop flat tang so it will never close on your hand. The Knipper: just a little knife that takes up just a little space. 0-1 tool steel in a Kydex belt/neck sheath. Old Glory, long may she wave! The Constitution provides no freedoms. 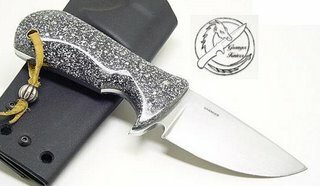 Here is a nice damascus knife. The steel is comprised of 52100, 15N20 & 1084. The fittings are brass and the handle is desert ironwood & cabreuva. 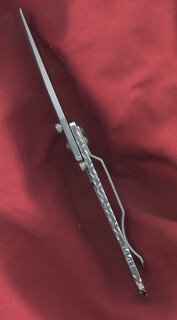 Here is a filed Halligan/CRKT K.I.S.S. knife. 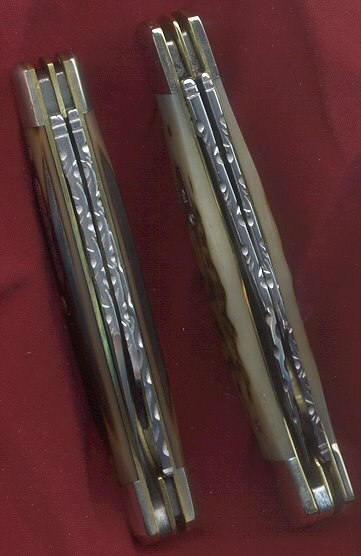 A two-blade trapper with booked matched file work. The other side of the Halligan designed K.I.S.S. by CRKT. Simple, elegant and functional. 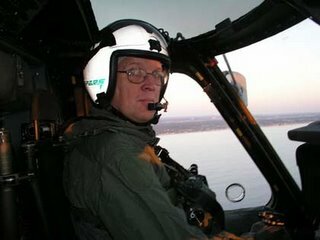 Ed Halligan is a Master, both literally and figuratively speaking. 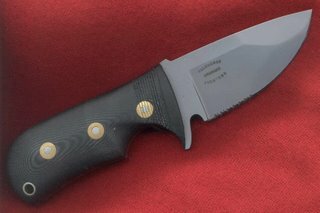 Black linen micarta, stainless serrated blade, totally bead-blasted. 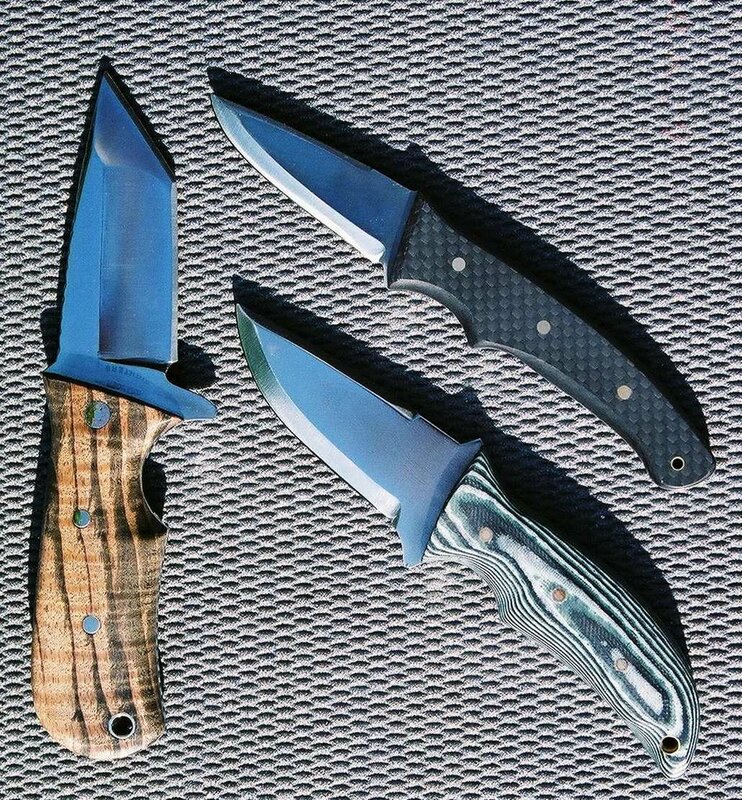 Carbon fiber handles w/micarta pins, tanto blade w/serrations. Fully polished blade, chechen handles & n/s pins. A Model 1 that I made for my friend Fred. 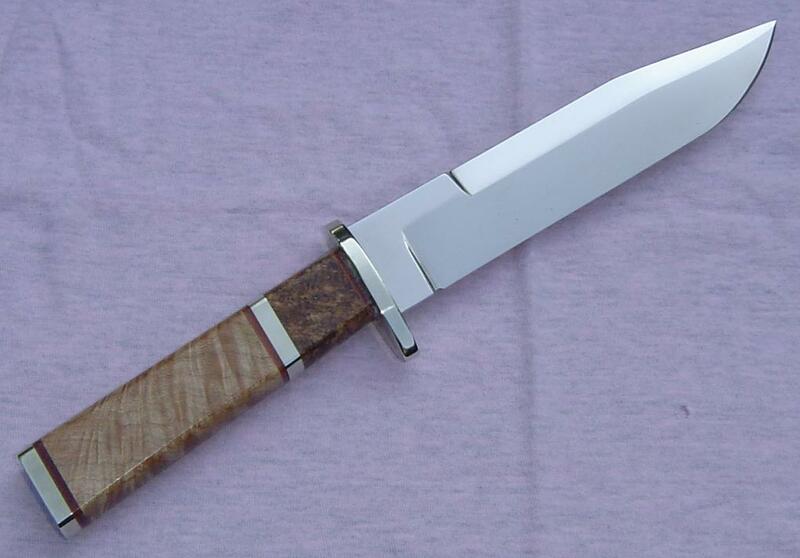 Polished blade, corian handles & kydex sheath. PHF Model 9. Stylishly dressed in stabilised maple burl w/Loveless bolts. One of my most favorites. 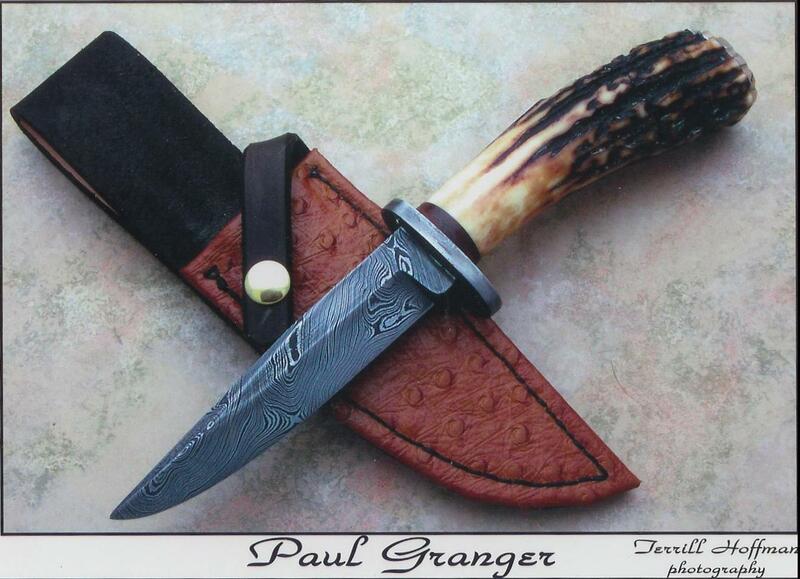 A skinner of forged 0-1 & sambar stag made for my Father-in-Law, Frank. He is a real Roman, and a good man to know. One of the fun things about forging your own blades is that you can work with found metal. This is a Diamond brand adjustable wrench. Notice the left side states: No Hammering. ooops! Another Lost Lady. She went missing in October of '05 with the knife posted earlier. Another high compliment from a lowly swine. If you see this one out there, don't turn your back on her captor. Unless your wallet is in your front pocket. Number 150. She is borne in a nice Randall-styled sheath with a belt/frog stud. a GKI Model 1 made for my friend Mark. The PHF Model 4 for a fellow artisan, Tom Stratton. You may view his craft at www.vintageknives.com. He is without equal. 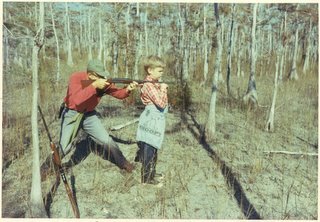 The old Leatherneck begins to teach the future soldier how to run ops in the jungles and marshes of the Everglades. How I miss him! Here's an early favorite. Damascus, brass guard, mosaic pins, corian handles and a brass thong hole. She was a beauty; fit the hand so well! Here is a friend of mine taking his JS cutting test at the Halligan ranch a few years ago. Notice the severed rope falling to the ground. What an acheivement! What a photograph (watch out B.R.!). L.C. passed the test that day and the rest is history. 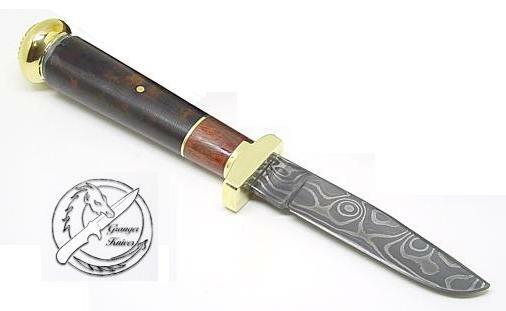 A tactical tanto with cocobolo handles and a kydex sheath. A good smith never throws away a used file or rasp. Deep inside there is a knife waiting to be brought out. You wouldn't throw away a good knife, would you? My Hero, N.B. the most clear-minded and straight thinking man I have ever met. I owe you more than you can ever know, sir. GPR stands for glass-phenolic-resin. It is the strongest laminate available. 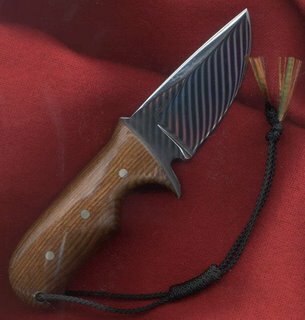 For years many makers have offered a non-metallic knife of zytel or G-10. However this knife will cut right thru either. Due to it's concealability, incredible strength and edge-holding ability, it is available only to those in service to our nation and our communities. 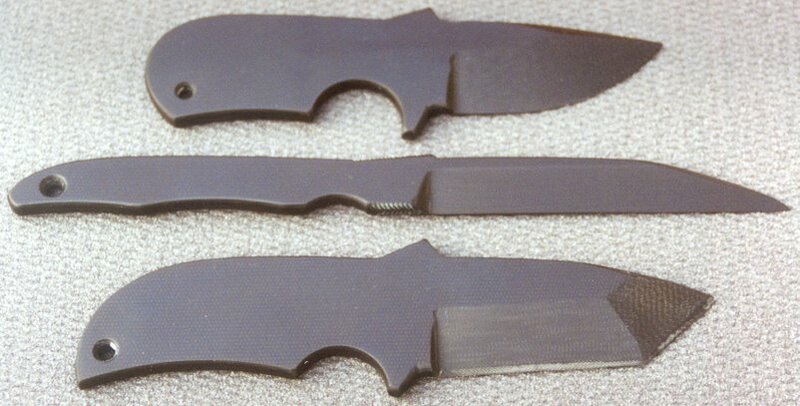 A nice little trio of knives. A GKI Model 1 on the left with spaulted tiger maple, a Model 3 at top with carbon fiber handles and a Model 3 at bottom right with green/green/black G-10 handles. PHF Model 5 another fine tactial tool. 5" x 0.1875" stainless blade, black linen micarta, 4 pins and a thong hole all lightly bead blasted. Borne in a kydex MPMT sheath. MPMT, micarta, kydex and GPR are all registered sm or tm. 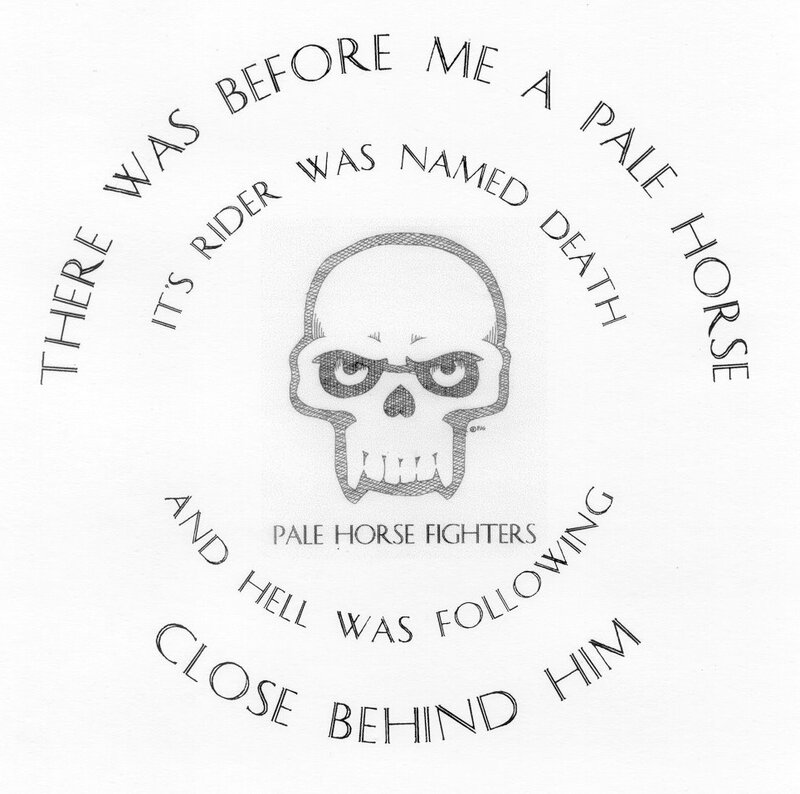 We found our company name in a phrase from a very good book. 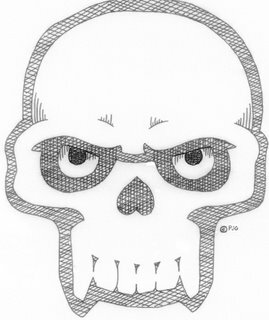 This one is "My Knife". 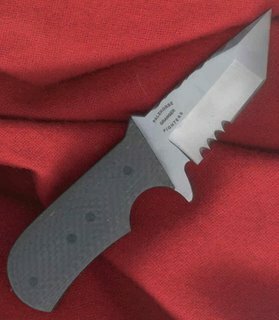 Mr Warner helped me discover this at the BLADE Show in June. Expect to see more of these at the '07 BLADE Show. Viewers of this blog will see them first. Thanks for all the good advice, Ken! 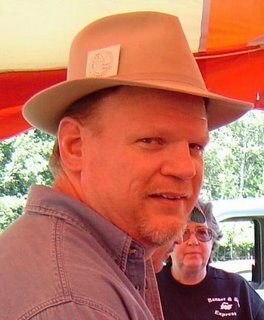 Here's a non-catalog model. Stainless with a 4.5" x 0.1875" blade. Black linen micarta handles with Loveless bolts and a thong tube. She is borne in a MPMT kydex sheath. I believe she found a home with a gentleman in California. Here's another tactical tool. The PHF Model 10. It sports a 5" stainless blade that is 0.1875" thick. She has black Micarta handles with 2 Loveless bolts and a mosaic pin above the forefinger groove. She is borne in a Kydex sheath that is MultiPosition/MultiTension (MPMT is a sm registered 1991). She was published in Blade, Tactical Knives, Knives Digest and the Krause/Blade KNIVES annual. She received international attention and international orders. 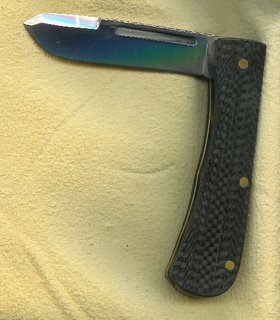 She was sold thru our friends at Arizona Custom Knives. This one was one of my favorites. Hand-forged 52100, with brass fittings, copper spacers and a cocobolo/stag handle. Unfortunately she went missing about October of '05. It was a heart breaker. 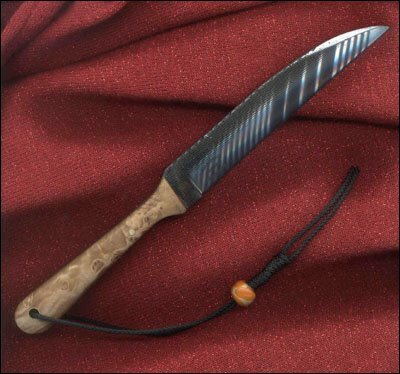 But a friend of mine recently helped me understand that some pathetic person loved that knife so much that they stooped to lowly behavior to make her their own. Thank you, G.E. for your wisdom. If anyone sees her out there, tell her I miss her. Then look her captor in the eye and know him for what he is. This is one of our tactical endeavours. 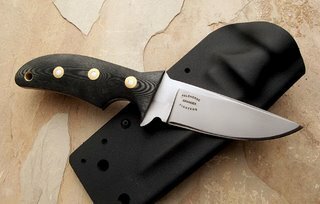 Stainless 5" blade, .25" thick with a black linen micarta handle, Loveless bolts, thong tube and a Kydex sheath. 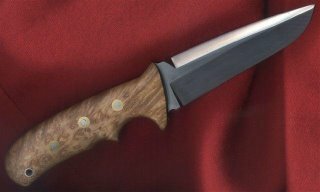 I had a gentleman request that I make him one with the blade steel 0.375" thick. It had a 40 degree blade bevel and still was razor sharp. gentleman that lives in the former home of William Scagel. If you are visiting Michigan, I suggest you try to meet him thru one of the knifemaking organisations there. He may occasionally permit visitors. The GK Model 1 has been so popular that two other makers have made their own versions of it. weapons and EDC utility knives since 1997. 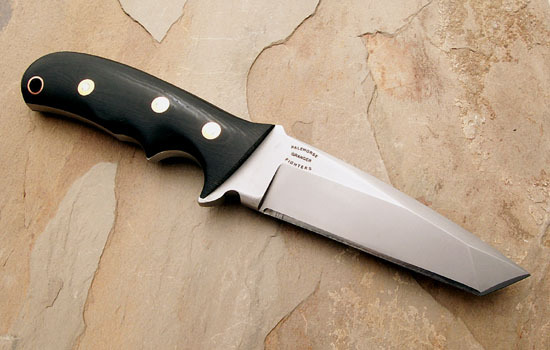 This knife was made out of a quality american-made mill file. 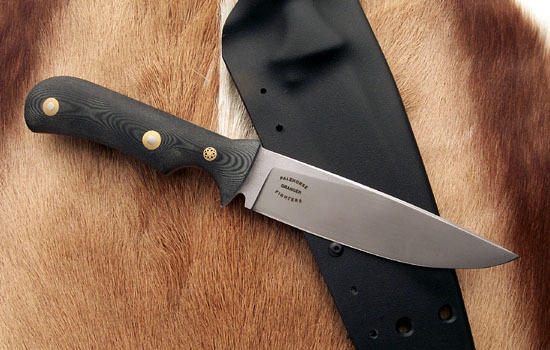 This company's files are created from 1095, an excellent knife-making steel. 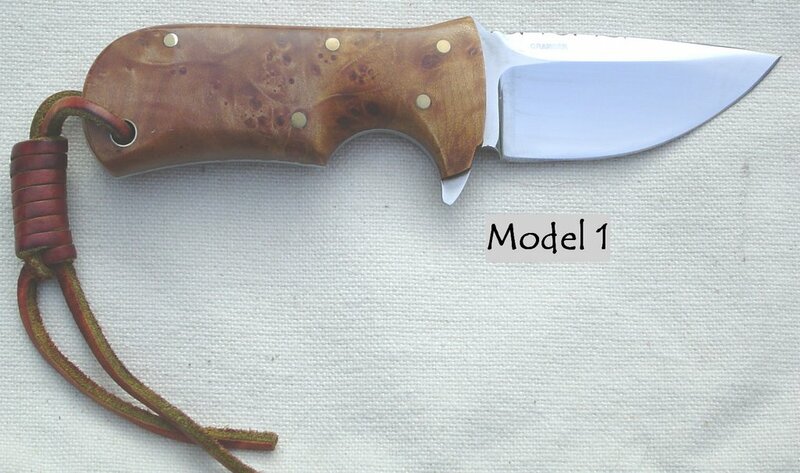 It features a maple burl handle and a razor-sharp edge. Pale Horse Fighter a non-catalog knife. 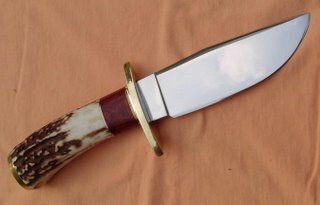 Damascus of my making, damascus guard, stag handle & ostrich sheath. 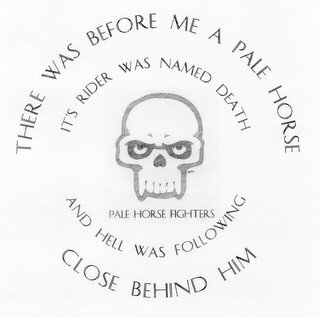 greetings and welcome to Pale Horse Fighters, the tactical arm of Granger Knives. 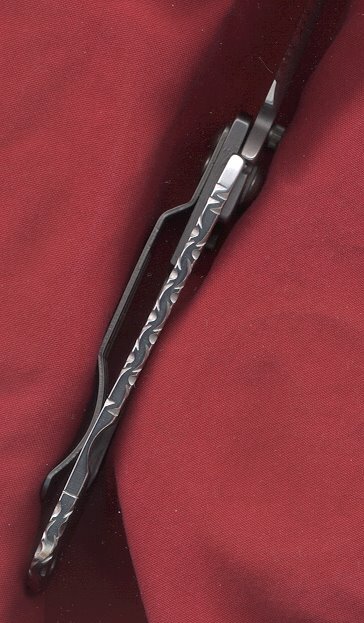 we've created edged weapons and edc utility knives since 1997.